For those of you that don’t know earlier this week, Toby had an operation under general anaesthetic. It was possibly one of the scariest things I have ever experienced. Not because I didn’t have complete faith in the surgeons, but because when it’s your baby on the table, it’s a whole new ball game! Toby had an Orchidopexy, which is a procedure to move an undescended testicle and ﬁx it into the scrotum. Whilst I’m absolutely not doctor, I am a mummy who has been through this procedure with her little one and I googled the shiz out of orchidopexy but there was nothing but risk potentials and medical gargon about the procedure, so I thought this would be helpful for anyone who wants a MUMs (non-medical) point of view about what to expect with an orchidopexy. Once again for the legal boﬃns – not a doctor, not a medical professional, just a mum sat next to a little boy who had the procedure yesterday. Good? What to expect when your little one is having an Orchidopexy. First thing is ﬁrst, the preassessment. Toby had his preassessment roughly 10 days before his op and it was SO reassuring. The appointment lasted longer than I expected, about 45mins and they went through everything, from checking vitals to checking that Adam and I were happy with all the info. There was a nurse to take vitals and explain the procedure to us and a play specialist to explain the procedure to Toby with the help of a teddy and all the equipment that that was going to be used to help him go oﬀ to sleep. The play specialist was AMAZING with Toby – they really made him feel so reassured. Honestly, so helpful. The nurse asks questions about his allergies, reactions to drugs and (he one I wasn’t expecting) his teeth being wobbly! Apparently this is because wobbly teeth can sometimes be knocked out by the tubes that they use to keep a patient asleep under general anaesthetic. 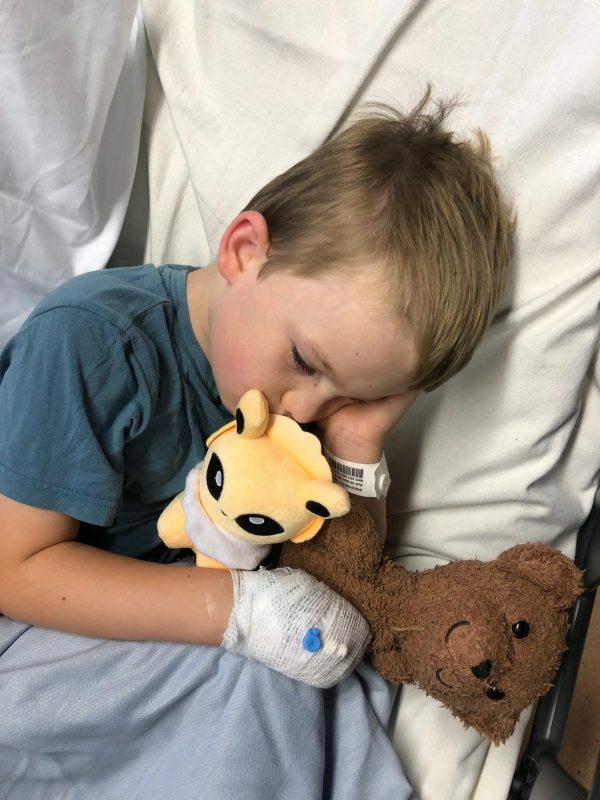 When we had our preassessment they gave Tobes a few things to help him process the op, from a colouring sheet with loads of info on it to a video link where he could watch exactly what was going to happen. 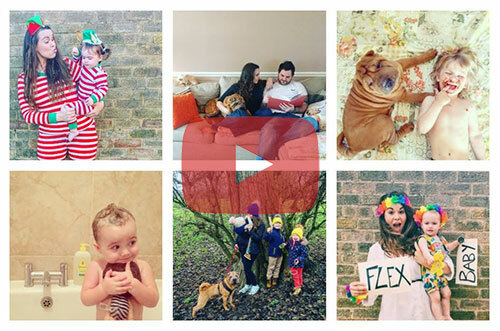 The video was fabulous – designed for kids and SO helpful, it literally did a walk through of what to expect and who he would see. You didn’t see the operation of course, but a little girl going oﬀ to sleep under general. After the preassessment I did my best to answer any of his questions, to reassure him as much as possible, but I think your little one is always going to be nervous. It’s part and parcel! The night before the operation Toby was really worried. We put him in our bed, snuggled up with him and chatted about why he didn’t need to be afraid, the things that I would be putting in his bag. Once he’d dropped oﬀ, I came downstairs and did a little check list of things that we would be taking with us, from books he wanted to pack to stickers books and his kindle. It’s either an early start (if you have a morning surgery) or it’s a stressful wait, so pack your bag the night before. Little toys to keep him entertained. 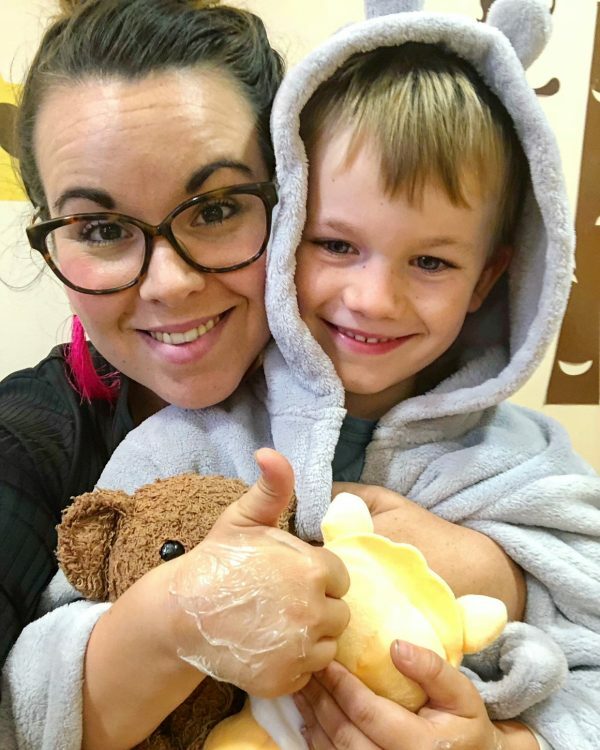 You can take whatever you want and at the preassessment they said there was no need to get changed into pjs BUT that most children want to curl up after their operation, so whatever he is super comfy in is the best idea for Tobias, that’s 100% the pjs and dressing gown combo. We had an afternoon list so Toby was allowed to have breakfast, but the details will all be given to you of exactly what cut oﬀ times your child will have for food and drink. When we arrived we let Toby have a drink of water and then that was it, he had to go without for a few hours. This wasn’t as much of an issue as I thought it might be to be honest, he was really good and not all that fussed at all! When we arrived on the day unit we were taken to a separate waiting area for kids. To be fair we were told that there would be lots for him to do but there wasn’t and the little waiting room was pretty crowded so I am so pleased I took his kindle and all the books/stickers. It made a world of diﬀerence. 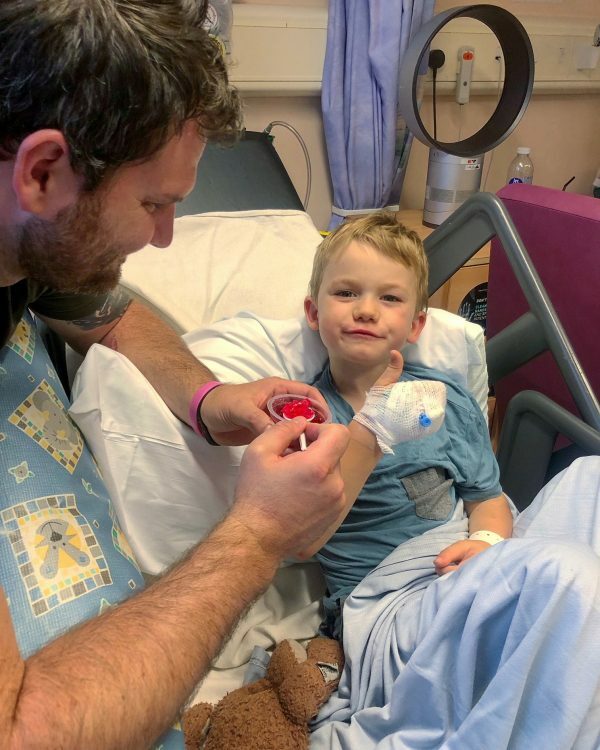 We saw the anaesthetist who asked if we had any questions and popped some numbing cream on Toby’s hands, after that we saw the consultant who went over the procedure one ﬁnal time and got us to sign to say we were happy with everything. He also drew a target on Toby’s leg to make sure they knew which side was to be operated on. For us there were two possibilities – 1 small incision underneath the scrotum which would be done with a couple of dissolvable stitches and where he would just have the testicle pulled down and tacked in place, or option 2 (which is what he ended up having) a small incision just above the groin and another underneath his scrotum. Toby went down to the theatre with his Daddy, which at the time I was really upset about. I didn’t let it show because he asked for his dad but ultimately I wanted to be the one with him – it really did make me feel panicky not being there but after seeing Adam when he came back I’m so very pleased I didn’t. Adam and Toby went into the room where they put him under, he could either be on daddy’s lap or on the bed and he chose the bed. They used the cannula whilst he was playing on a tablet, if this hadn’t been possible for whatever reason, he would have used the mask to go oﬀ to sleep with. Once he was asleep, Adam and I went for coﬀee and cake. If I can impart upon you, dearest reader, one piece of advice when your child is under general anaesthetic it is that calories don’t count on hospital grounds and you ABSOLUTELY have to faceplant cake. All the cake. We were told that it would be around an hour before we were called to recovery but it was so much sooner, we practically ran to get him. It was around 35mins but it’s diﬀerent for absolutely everyone, so don’t panic if it’s longer than you expected. Once in recovery they let him doze for a while and then woke him up which he wasn’t happy about. He was still in the “drunk” phase, vey dizzy and very tired, a little weepy because he wanted to sleep, but not in any immediate pain. It was another 2hrs or so on the ward with him, they get them a drink and then wait a little while before oﬀering food. You can take a pack up (or we were oﬀered the chance) or they will supply food. Tobes ate ERRRTHANG. He had a ham sandwich, packet of crisps, bowl of jelly, a packet of wine gums and then some mini sausages and grapes when he came home. He was famished! If everything goes to plan you can go home the same day! We were told a few diﬀerent things, from 4-5 days oﬀ school to a week, but we’re playing it by ear. He’s up and about, shooting nerf guns as I speak but every so often he bends over and says he hurts. It’s very much up and down at the moment! We’ve been told a shower the day after and a bath the day after that, and to keep him quiet – no sports for around 3 weeks. The biggest challenge is going to be keeping him still and quiet! I think I will write a couple more posts with handy tips that have helped me, but as far as an orchidopexy, that’s what to expect! I’m so glad I’ve read this!! My little boy will be 23 months old when he has this done next month; I’m stepping up and being the parent to take him in to “go to sleep”. My husband has already had to do this once with his daughter when she was 4 days old and I will not let him do it again! I’m dreading it, especially keeping him calm and still!! He’s a total head case lol How do you tell a hyperactive 2 year old to stay still?! Answers in a post card! x I hope your little man has a quick recovery…. I will keep an eye for recovery updates!! Thank you so much for writing this I’ve just found out my son who is nearly 7 is needing this done after being told 2 years ago he didn’t . I’m so nervous about it and annoyed that it could have been sooner, glad to hear all Went ok and recovery seems to be going well. Must be really scary while they are having the procedure done. I’m a single mummy so will be having lots of cake and tea to try settle my nerves. Hi Gemma, oh bless you – this is exactly the same with Toby, he was told he didn’t need it and then BAM he did. I was seething – I feel your pain. Sending you hugs, you’ve got this. The hardest part for us is keeping Tobes quiet and calm now – he is dying to go back to school but can’t!